Following a visit to Brussels, Belgium, Minister for Defence Marise Payne and defence ministers from the counter-Daesh alliance have revealed they are progressing with their military campaign and are on track to commence liberation operations in west Mosul. The ministers reviewed the progress of the military campaign, discussed the next steps and, after three months of operations to liberate Mosul, have confirmed that east Mosul is liberated and operations will commence shortly to liberate west Mosul, Daesh's last major stronghold in Iraq. The ministers also discussed the importance of the coalition's efforts in tackling the threat of Daesh directed or inspired violent extremism. Minister Payne emphasised the importance Australia places on countering extremism in south-east Asia, particularly as Daesh’s losses in Iraq and Syria may lead to some foreign fighters returning to the region. While in Brussels, Minister Payne also had a bilateral meeting with US Secretary of Defense James Mattis to discuss mutual strategic interests in Iraq, Afghanistan and the South China Sea. With many criticisms and concerns surrounding the Australia and US alliance after Donald Trump and Malcom Turnball's now infamous phone call, Minister Payne reiterated that the Australia-US alliance is, and will continue to be, the Australian government’s highest strategic policy. Minister Payne also met with the NATO Secretary General Jens Stoltenberg to discuss shared interests, including in Afghanistan and Iraq. 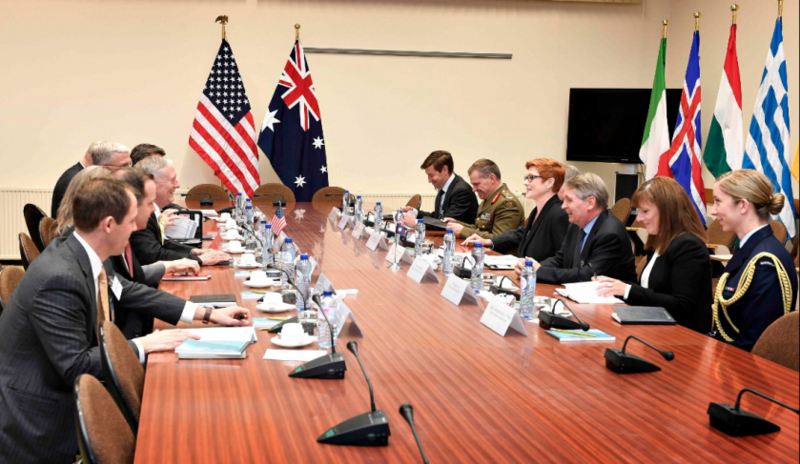 Australia is a leading contributor to the US-led coalition to counter Daesh. The ADF, operating as part of the broader US-led coalition, is providing support to the Iraqi Security Forces during the Mosul offensive, through the Air Task Group's air operations, and the Building Partner Capacity and Advise and Assist missions.